Youn g children are naturally open and creative, and art projects are a very significant part of our program. Our two head teachers both have art degrees and aim to procure and explore interesting, age-appropriate media and materials. Children are encouraged to create sculptures out of found materials such as cardboard, bottle caps, mosaic tiles, and floppy discs. They are the architects and designers of cardboard houses, storefronts, and spaceships. 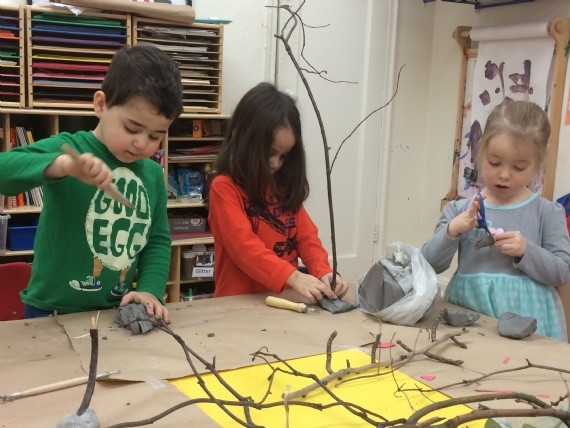 Osher children experiment with varied materials such as clay, textured paper, charcoal, watercolor, and pastels, and are given opportunities to draw, experiment and create every day. Experimentations are regarded seriously, supporting our children's confidence and encouraging their growth.